Guinea pigs are known for their gentle demeanors, and when treated with kindness can become loving and affectionate pets. Creating a welcoming, safe and appropriate living environment for your guinea pigs is the first step in establishing trusting bonds. Make sure your pigs are in a quiet environment, at least initially, so they can become acclimated to their new home before being introduced to other household pets, noises and activities. Guinea pigs can be a bit anxious when getting used to a new environment, so talk to them in their cages to get them used to your voice as you go about regular caretaking tasks. Speak to them when you change their water, add bedding and feed them. Offer treats by hand so they start associating you with good things and become accustomed to your scent. Provide equal attention to guinea pigs sharing the same cage to avoiding fighting for attention. Take a hands-on approach to interacting with your guinea pigs by handling them and playing with each one for at least a half an hour every day. Hold your guinea pigs close to your body when you move them so they don’t feel like they’re falling. Play on a low, flat surface to limit injury. Initially, let your guinea pigs come to you for treats and physical contact, and when you establish trust, encourage more interactive play. 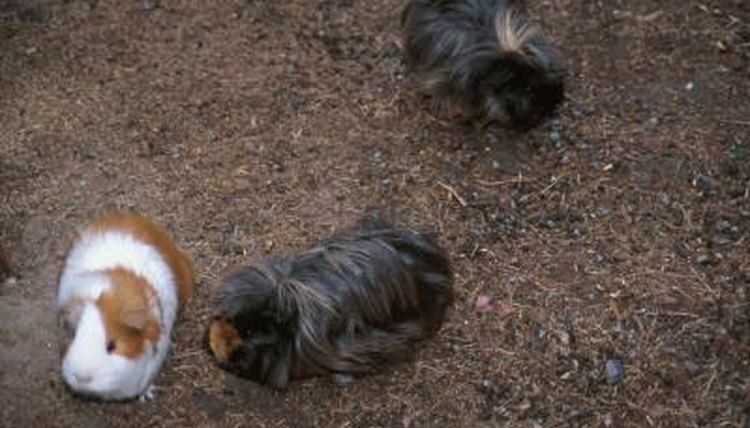 Use guinea pig-appropriate toys like grass play balls, tubes, tunnels and ramps. Guinea pigs can startle easily, so make every effort not to scare your pigs. Some animals are more sensitive to loud noises or hectic activity than others, so be mindful of your guinea pig’s individual personality and create an environment where he’s comfortable. Never yell at your guinea pigs, hit them or “punish” them by withholding food, water or attention. This can eliminate trust and make your pigs fearful of you. Offer your guinea pigs different treats and snacks. You’ll soon discover favorite food items that make your pigs especially happy. Regularly change out toys for your guinea pigs to keep them entertained. Many commercial cages allow you to change the configurations of ramps and levels and add different features, like hiding spots. Providing ongoing gentle, caring attention will make your guinea pigs happy and content. The Human Society of the United States: Guinea Pigs: The Right Pet for You?